The plight of the bed and breakfast or small hotel owner got quite a bit harder in 2005 and 2006 when new fire safety regulations aimed at large hotels were deemed to be applicable to these smaller outlets as well. This coincided with changes in rules for fire safety certification as well, leading to wholesale confusion and uncertainty in an already depressed market. Fortunately common sense appears to have prevailed and new government guidelines have discouraged the application of the full letter of the law for smaller establishments. But confusion still remains in some areas with disproportionate enforcement around the United Kingdom. The climbdown was thanks in large part to a strong campaign by the various tourism and accommodation organisations, as well as small business associations, under the umbrella of the Fire Safety SENSE Campaign. The campaign was complicated by the fact that the regulations are handled by different authorities in Scotland so the campaign had to be fought and co-ordinated on two fronts. The main problem was around the new fire regulations introduced in 2005. 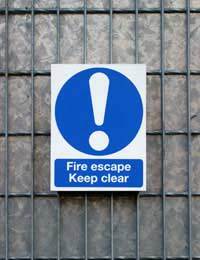 The Fire (Scotland) Act and the Regulatory Reform (Fire Safety) Order covering England and Wales were different pieces of regulation but had similar effects. They both shifted the onus for fire certification from local fire brigade officers to the B&B owners, requiring them to perform their own fire safety assessments. The intention, if both regulations are scrutinised carefully, was to allow proportionate application of fire safety measures, so that owners of three-bed B&B's would not be expected to put in full fire automatic protection systems that would be more appropriate to a one hundred bedroom six-storey hotel. But the reality was very different. Throughout 2006 and in subsequent years the campaign heard hundreds of stories of disproportionate applications of the new regulations, all over the UK. B&B owners told of fire safety officers threatening court action if they did not put in thousands of pounds worth of alarm equipment. Others reported fire departments insisting on full-on emergency lighting while others were allowed to count hand torches as emergency lighting. To be fair the local fire and rescue authorise were as much at a disadvantage of the process as B&B and guest house owners. The shift in the focus of the regulations was a huge culture shock for the fire officers and many complained that they had not had sufficient guidance and training to be able implement the change successfully. In late 2008 the government in Westminster produced a leaflet "Do You Have Paying Guests?" which sought to clear up the confusion. It was distributed throughout 2009 but still reports came in of fire officers refusing to apply it, one reportedly telling a B&B owner in late 2009 that they didn’t work to that leaflet in their region. As a result of this, seminars for Senior Fire safety Officers through England and Wales were arranged by the Chief Fire Officers Association and so far there have been no reports of any similar events. Although this leaflet wasn't relevant in Scotland, late in 2009 the government there put enforcement action against small B&B establishments on hold. A review and consultation process was started to arrive at legislation that made sense for small hotel and B&B owners, being applied consistently but proportionately. So it does look as though common sense has prevailed and there are efforts throughout the UK to make sure that small B&B's and hotels remain safe but are not threatened by disproportionately high charges for safety systems that are inappropriate. The best approach for people considering entering the B&B market is to check the current situation with their local fire officer.